“I would like to be the New York Ayrshire Princess not for the crown or the sash or the honor, but for the responsibility. I believe that being the Ayrshire Princess should be a reward, but a job” said Katelyn Walley. 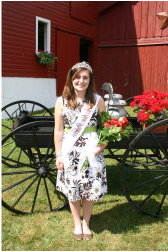 Katelyn Walley, the 19 year-old daughter of Bill and Kim Walley of Gold-N-Ayr Farms, Walton, New York was crowned the New York Ayrshire Princess during the New York Ayrshire Club picnic hosted at Cedarcut Farm, Cazenovia, New York. Walley, a sophomore at Cornell University, served as New York State Alternate Dairy Princess, was a member of the National Champion Ayrshire Dairy Bowl Team from New York in 2011. She is a member of the Cornell Dairy Science Club and is serving as the Professional Development Chair of the Cornell University Sigma Alpha Chapter. Katelyn was been very active in 4-H and FFA on the county, state and national levels. She also is a National Coca-Cola Scholar, New York State Farm Bureau Scholar, and a Dairy Herd Improvement Scholar. The 2010-2011 New York Ayrshire Princess, Sara Pulver, of Fort Edward, New York, crowned Walley. Pulver was recognized and thanked for an outstanding job during her reign as Ayrshire Princess. Pulver traveled through out New York and into New England representing the Ayrshire Breeders’ of New York State.